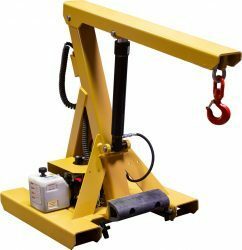 Powered Jib Boom (PJB) cranes lift loads of up to 3,000 pounds, and are crucial to many industries, including manufacturing, warehousing, scrap recycling, and automotive repair. The fully portable nature of BHS jib cranes creates a highly adaptable solution for lifting tasks facility-wide. Whereas most jib cranes are bolted to floors, creating additional costs for site preparation and footing, the PJB can be easily transported by lift truck. All units are manufactured with standard fork pockets at the base. This allows the PJB to perform lifting tasks in high-traffic areas, then be stored elsewhere to preserve valuable square footage. Powered Jib Booms from BHS feature steel construction with a powder-coat finish that resists scratches, chemicals, and rust. These units are designed and built for harsh environments, and are suitable for indoor and outdoor use. BHS also manufactures custom jib cranes to customer specifications. Powered Jib Booms can be customized to fit any application. To learn more about custom lifting equipment from BHS, or to locate a dealer, call 1.800.BHS.9500.